Yoga mats are essential for your yoga practice, and while you can simply buy any mat available at your sports specialty store, you may find it great to know that you actually have several choices and options when it comes to buying. Read on to find out tips on buying them so you can choose the perfect one for you. There are different types of yoga mats, which are created for different purposes, too. There are travel mats which are lightweight, thin and super portable. Ashtanga mats on the other hand are made of cotton and are designed for intense yoga practices that involve a lot of sweat. Universal or conventional yoga mats are the typical rubberized mats that are used in many yoga studios and are recommended for beginners. Then there are Deluxe and Utopian yoga mats, which are high end and enhanced versions of the conventional mat. They are plush and provide excellent cushioning and stability to users. 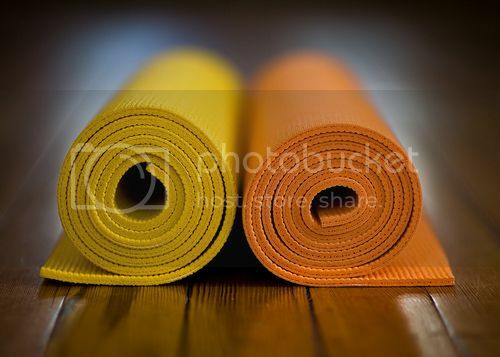 Yoga mats are made from different types of material, PVC being the most common one. PVC versions are durable and provide a good grip; they are affordable too. Some problems with PVC mats are that they can sometimes become slippery due to sweat, non biodegradable and several users have reported skin allergy issues, too. The next types of mats are the eco-friendly ones that are made from plant based material and completely free from PVC. The process in making these yoga mats is sustainable and at the end of their life-span, they can be composted. Last are mats made of cotton. These are perfect for yoga styles that produce a lot of sweat because cotton mats are activated by moisture. As they become wet, they stick to the surface, preventing slipping and sliding. Yoga mats come in different sizes and weights. Some are extremely light and compact, while others are big and bulky. If you regularly travel or bring your yoga mat to class, then you might appreciate a mat that is lightweight and thin. If you do practice at home, then size and weight may not be a problem for you. Aside from shape, size and weight they also come in different colors, and while this factor is not really that important when it comes to functionality, you may still want to pick a mat that comes in the color you like. Tip 4: How Much Can You Afford For a Yoga Mat? Just as yoga mats come in different sizes, they also come in different prices. Generic choices can start as low as $10, but you can also pick premium options with prices that can go as high as $100. Determine how much you can afford for the meantime and how much you want to invest first. If you’re just starting out, you may want to pick a cheaper yoga mat until you decide to take yoga seriously. Otherwise, you may end up with an expensive and unused yoga mat inside your closet. These are just a few tips that should help you find the best yoga mats to suit your needs. So go ahead, choose wisely and have fun shopping! When you are ready to try Yoga, use Yogiseeker's yoga search engine for free and find a yoga studio year you.